Keeping Care Complete, developed in partnership with the World Federation for Mental Health, Eli Lilly and Company and Eufami, was illustrated during a press conference held in Barcelona on the 2nd September 2008. Gathering perspectives of 697 psychiatrists from Australia, Canada, France, Germany, Italy, Portugal, Spain, the United Kingdom and the United States, the survey tapped into their insights on how family caregivers, stigma, treatment non-adherence and relapse affect the lives of people living with these debilitating illnesses. Findings show that psychiatrists have frequently seen how relapse can be a devastating blow to both individuals and their families, and how this has resulted in hospitalization, employment loss, incarceration or even suicide. 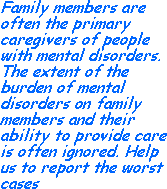 This survey of psychiatrists, the second of a Keeping Care Complete series of surveys, builds upon findings from a 2006 assessment of 1,082 caregivers that shed light on experiences of family caregivers of individuals with bipolar disorder, schizophrenia and schizoaffective disorder.